Swami Dyananda Saraswati is exactly the sort of spiritual teacher most seekers hope to study under. He is witty, charismatic, and decidedly beyond worldly concerns. Yet, he functions in our terrestrial realm with quite a high level of competency. It is easy to understand why his Arsha Vidya Gurukulam ashram draws students from around the world for its celebrated five-week course—and he is a major reason why they keep coming back. They might not necessarily attain enlightenment, because that is the sort of thing you never find when you look for it. 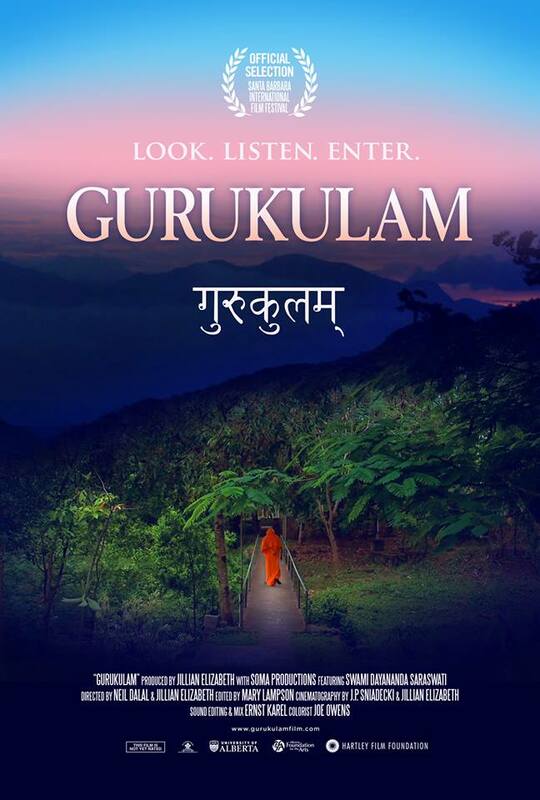 Nevertheless, the Swami’s diverse students will find some degree of illumination through his words in Jillian Elizabeth & Neil Dalal’s Gurukulam (trailer here), which fittingly screens this weekend at the Rubin Museum of Art in Chelsea. Advaita Vedanta is the oldest school of Vedanta, the Hinduist philosophical tradition to which J.D. Salinger subscribed to sometime after the publication of Catcher in the Rye. Frankly, Salinger was far more of a hermit or Stylite than the Swami ever was. Despite renouncing the world, he is quite sociable and gregarious. Clearly, enlightenment will not begrudge a little friendly conversation. For obvious reasons, those most interest in Vedic and Hindu religious thought will get considerably more out the documentary than comparatively casual viewers. However, it is still rather intriguing as a work of non-fiction filmmaking. At various points, Elizabeth and Dalal essentially present the audience with a choice. They can either join in Swami Dyananda’s meditation and visualization exercises, or they can remain spectators. They are both valid choices, but you have to choose. Of course, much of Gurukulam is devoted to quiet observation, but it is never as hushed as Into Great Silence (a not terrible comparative film). There is always plenty of life going on at the Arsha Vidya. In fact, even to shallow agnostics, it looks quite livable for an ashram nestled in the rainforests of southern India. Indeed, this is an unusually transporting film, submerging viewers in the sights and ambient sounds of Arsha Vidya Gurukulam and its surrounding environs. Serving as cinematographer, documentarian J.P. Sniadecki (whose are films are screening throughout Manhattan this week) has a keen eye both for the big, symbolically loaded Samsara-esque shots, as well as the smaller, lighter moments of bonhomie. Gurukulam will probably not inspire scores of new Vedic adherents to flock to the Swami’s ashram, but that means all of us unabashed materialists can feel safe watching it. It will definitely take you someplace you have never been before. Once there, Elizabeth, Dalal, and editor Mary Lampson show a shrewd editorial judgment focusing on telling details. It is a finely crafted film under any circumstances, but there will be no better venue to see it amongst a knowledgeable and sympathetic audience than the Rubin Museum. Recommended for those who enjoy meditative and immersive documentaries, Gurukulam screens this Saturday (8/22), Sunday (8/23), and Monday (8/24) at the Rubin Museum of Art.